We went last time house hopping here in Las Vegas. MY bro-in-law have some customers looking for houses to buy. 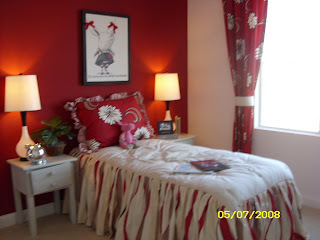 This room just caught my attention..I love its color..if I win in lotto, I might buy one too...hahaha!! i'm dreaming...who knows anyway!! besides it's free to dream!! Any one who want to buy houses in Las Vegas, I can refer you to my Bro-in-Law..he an give you a great deal!! see yah! !